The need to have antivirus protection is understood enough by the general population that it is an almost reflexive action to buy the latest premium antivirus software at the same time the new computer is bought and paid for. Symantec's Norton Antivirus is highly regarded by many reviewers for its effectiveness in protecting your system, yet the web is flooded by a steady stream of complaints that Norton is a resource hog, bloatware, takes up too much RAM, is slower than other security programs, or all of the above. Some of these complaints are a result of too many users trying to run the latest edition on older machines or operating systems. If your machine is relatively new, there are a couple of ways to reduce the demands that Norton will make upon your system. If you want to check your Norton CPU usage to see how much your Norton system is taking up in the way of system resources, there are some relatively simple tasks you can do. One quick way is to simply open the Task manager (Press Ctrl+Alt+Delete) and check on 'Processes'. That number next to Norton will tell you what percentage of system resources Norton is currently consuming. In the Norton 360 main window and click Task. In the Tasks window, under PC Tuneup Tasks, click CPU Usage. To magnify the entire CPU graph or memory graph, click Zoom I. To magnify a portion of the CPU graph or memory graph, select the portion that you want to magnify, and then click Zoom In. However, neither of these methods will allow you to reduce the CPU demands made by Norton itself. The heavy level CPU cycles is a common complaint among users of Norton Internet security products. It is perhaps inevitable that a security suite with a great deal of options and extras that is highly customizable will, over time, mutate into system-hogging bloatware. To Symantec's credit, they do have some means available to address this common complaint. Since the 2009 editions, Norton users have been able to set their their idle time so that Norton will not run background tasks until a set amount of idle time has passed. Setting it to about 20 minutes is a good way to ensure it will not start to run background tasks while you are browsing or using other programs. Also, turning off compressed file scanning will reduce load time a little bit. Another trick is to turn off the early-load feature in your auto-protect options. I do not recommend doing this unless Norton is using more than 50% of your resources, as it can reduce your system's level of protection. Norton has also provided a tool called Norton Insight to check what is dragging down system performance, and gives users the option to reduce the number of files that Norton will constantly scan for viruses. Without any change in settings, Norton will automatically assume that all your files are a risk. Using this tool will allow you to tell Norton which of your files are low-risk, reducing the program's workload and freeing up system resources, so you can get back running to your first-person-shooter or MMORGG in full HD graphics settings. In order to get the most out of Norton Insight, you will have to instruct it to disregard all but the most critical files during a quick scan. This can vary per user, but I would recommend keeping core system files, any folders where you share files, your download folder, and your browser registries. A corruption of your system registry could lead to catastrophic system failure, and those other folders are where viruses and spyware most often infiltrate through. If reducing your level of system performance to make your computer usable does not appeal to you, there are several other security suites that are regarded as requiring lower system loads. Avast is a very popular option that is a speedy hare compared to the turtle that is Norton, and it has been downloaded over 160 million times. Avast also has a free version, but it does not include a firewall. However, the firewall is included in the Avast Pro version, which is $10 cheaper than Norton Internet Security and allows use on six computers per license key vs Norton's three. Bitdefender is another highly recommended security program. It is much more automated that other antivirus programs (that means less annoying pop ups) and allows system recovery without a recovery disk. The reason why its on this list is that the real-time resource usage is the lowest compared to other antivirus software on the market, using only about 0.8% of CPU/memory. It is also $10 less than Norton and allows a free trial. If you have already purchased a Norton License key or got it for free, use these methods to keep the system demands within manageable levels. If not, sample a free trial of a lighter antivirus or security program to see if that makes your PC faster and more enjoyable. 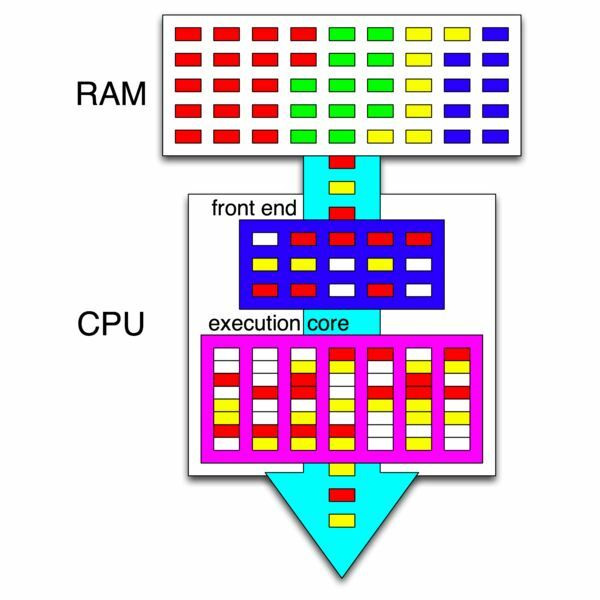 Photo Credit: http://it.wikipedia.org/wiki/File:Superthreaded_CPU.png, Public Domain.